It’s Friday. Everybody shout, “Huzzah!” and leap around like a maniac. 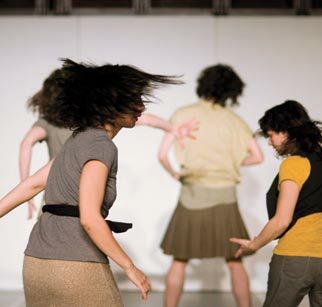 Tuesday, Jan 25: DanceHouse presents Speaking of Dance at 7pm at SFU Woodwards. Free as a bird. The topic for the evening is the New York downtown dance scene, and how Doug Elkins fits into it, in preparation for Fraulein Maria Feb 3, 4, & 5. Afterwards, you can go and see Ame Henderson from Toronto with her new piece Relay, happening at the Cultch from Jan 25-29 at 8pm. Tix at the Cultch box office from $15. Dances for a Small Stage retakes the Legion on the Drive from Wed-Fri of next week. Performances by Tara Cheyenne Friedenberg, Delia Brett, Susie Burpee (Toronto), Billy Marchenski, Kim Tuson, and Out Innerspace. Tix at the door, cash only, $20. Starting Thursday Jan 27, PuSh and the Dance Centre present Sound Machine, by Company Drift. Dance, theatre, sound and video combine to make a dream-like world. Tickets at TicketsTonight. A pretty good week for dance, no? ~ by DanceHouse on January 21, 2011.